One day a guy was watching his beautiful wife tend to his precious children and the phrase came to him… The Bomb Mom. For awhile he wasn’t sure what to do with it but eventually he realized it was a clothing line… a series of statement tees for all the beautiful (inside out) women who give their lives to mothering. The bomb moms. You can’t get anymore perfect than this sweet but hip sentiment. The Bomb Mom is a fab company that puts out these awesome tee s and onesies for moms and kids and babies. Now your little one can proudly display how they really feel about you, “My Mom’s the Bomb”. Every mom deserves the praise of their little one wearing one and they also deserve to wear one of their own as a badge of honor. In fact I asked if women’s sizes were available with the phrase “My Mom’s the Bomb” so my teenager could wear one. Personally I would love to wear “My Mom’s the Bomb” on mother’s day to honor my own mother. I’m going to further suggest men’s sizes to promote their own moms!!! I received my Copper tee and immediately put it on and while it’s a little snug (everything is) it’s super soft and the colors are rich. The tee is actually a good length too, I’m always complaining about too short shirts, skin peeking out when sitting, but this tee is a great length, no riding up. Sabreena quickly agreed to the saying and that made me feel good. “You are the bomb mom” she said, awwwwwwwww. This tee is going to look great with jeans, khakis, casual skirts and even lazy lounge pants if I’m feeling the need for a pick me up. I’m including The Bomb Mom in the Baby Shower Blog Party because every new mom sometimes needs a reminder that she is amazing, selfless and worth more than the her weight in gold. Give that gift that makes everyone take notice, give that new mommy you know a tee that says a thousand words with just three. Visit The Bomb Mom and tell me who in your life deserves the title The Bomb Mom. It could be your mom, neighbor, best friend, sister or yourself. EXTRA ENTRIES: To receive these extra opportunities for entries, you must fulfill the first REQUIRED entry above and please be sure your email in in your comment, attached to you blogger dashboard or easily seen on your website/blog. I will not search through About Me/Contact Me links. Your entries must follow the rules or they won’t be eligible for prizes. This contest ends 11:59 pm, Friday, August 21, 2009. Winners will be announced and emailed and will have 48 hours to claim prize. This contest is open to US residents. My mom totally deserves this, but I'm not sure she would wear the t-shirt. I'd love one for myself – hopefully I'll be a bomb mom to my little one due this fall! I definitely deserve this comment. Although when my mom was alive, she was definitely the mom bomb. I hate to say it, but I really want to nominate myself as The Bomb Mom! With four sons, I could really use some encouragement that I'm doing well. This shirt would be a real pick-me-up! I follow "Mom" "Dad" and "TheBombMom" and Twitter, and I tweeted this giveaway! I have your button on my blog, Susan Heim on Parenting, at http://susanheim.blogspot.com. following all three of you on Twitter- tally2525 and tweeted! I would give this shirt to my Mom- she raised all three of us- and runs a daycare and has "raised" too many kids to mention over the last 20 years! My mom deserves it but she would never wear it. she is 87. But I also am a bomb mom who takes care of the house full of people and animals that my son and his wife have collected. I think that I deserve it! I am a bomb Mom who stays home with our daughter and takes care of her, my husband and our household. My daughter does who is about to give birth anyday to my 2nd grandchild. 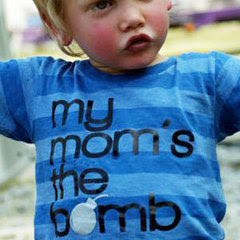 I think I'm the bomb mom — and I love these t-shirts.. Thanks for the chance to win this giveaway. Hope the plans for the baby shower are going well! I left a comment on the post Wordless Wednesday (riding his bike). I left a comment on the post We Are on Vacation This Week!!!!! I left a comment on the post Aloha Friday #13. I left a comment on the post My Top 10 Reasons I am Excited to Stay Home. I left a comment on the post Baby Shower Blog Party. I entered the Baby Shower Gift #1 Storkie Express. My mom deserves this, but wouldn't wear it, but I have 4 kids and I hope I'm a bomb mom too and I would wear it! I entered the angel baby set giveaway! My mom! She's definitely da bomb! I entered the baby Gift Basket company giveaway! I entered the storkies express giveaway! I entered the Kenneth Brown giveaway! I entered the Loving Baby, Inc. giveaway! I entered the nursing pillow and canopy giveaway! I think both of my daughters in law deserve the title The Bomb Mom. My mom deserves the title! I entered the Kissaluvs contest. I entered the Kushies contest. My friend Andrea deserves a tee. Entered the Earth Mama giveaway. Entered the diaper cake giveaway. Entered the nursery bedding giveaway. I deserve the title. Thanks for the giveaway! I entered the Laugh and Learn DVD giveaway! I entered the kissaluvs marvel diaper and bag giveaway! I followed on blogger (Sunny View)! I subscribed via email (sunnyview99 at gmail dot com)! I became a fan on Facebook (Sunny View)! My mom definitely deserves it. She's amazing for me and my siblings as well as the grandkids. I entered the Baby Shower Gift #10 Kushies Nursing Pillow and Canopy Giveaway. my best friend just had her first baby and she had a rough labor, i think shes a bomb mom alright! Hehe, I think I am the bomb. I work full-time and come home and cook and take care of the baby. We breastfeed, cloth diaper and co-sleep. I think that makes me da bomb. I also entered the kissaluvs giveaway. My mom is a bomb mom! She's a really great friend of mine. I can tell her almost anything. I hope to be as cool as her someday soon. I'm due with my first in December! I think I need it (maybe not deserve it, yet). It would remind me that I need to live up to the title for my own children and as a representative for other moms. I deserve to be the bomb mom. I entered the Storkie giveaway! My friend Laurie, shes awesome! I think I do deserve the title because I work part time, cook, clean (no help from hubby in that dept. ), take care of my 3 kids, do laundry, dishes and find time to have fun with my kids too! my sister in law deserves the bomb mom because she just had a baby has 2 jobs and is going back 2 college!!!!! I entered the Kenneth B. Giveaway. I entered the Storkie Express giveaway. My mom is the bomb mom! She's amazing, thanks! This T-shirt would be for me!! I totally deserve it!! My cousin totally deserves one! She is a young new mom, and she is doing an awesome job! I'm a fan on facebook! Sheila H.
I follow you all on twitter, and I tweeted! My mom deserves it. She is the best! Could be my mom. my sisters or me! My daughter who is 17, with a 2 yr old and graduating on time this year! i do because i'm doing it on my own.